The self-loading rapid-fire air pistol is intended both for sports shooting and for competition shooting complying with ISSF regulations. 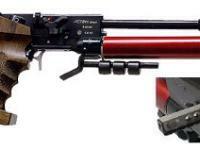 It can be used either as a single shot or five shot rapid-fire weapon. Unique cartridge shifting mechanism design allows extremely short rapid-fire times. All five pellets can be fired in less than 3 seconds. Energy source: 200bar (3000psi) compressed air filling from external pressure source. Grips: Anatomical right or left walnut grips with adjustable tilt 110 - 125"